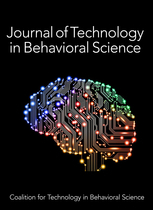 Want to be part of the Journal of Technology in Behavioral Science? Apply to join the editorial board. This is a service to you as members, as a way to enhance our careers rather than an advertisement, so to speak, for the Journal. I have also notified competing/overlapping journal (e.g., Academic Psychiatry, Tel J e-Health) Editor NAME and Manager NAME, as a courtesy, as our Journal is not in direct competition. 1) Are there datasets, key reviews or other manuscripts that I have not published? 2) Is there a good previously submitted manuscript, that with improvements, fits the Aims and Scopes of JTiBS? 3) Are my proteges, trainees and other interdisciplinary team members working on or finishing project or dataset that may be good for JTiBS? After reading the information below, if you are interested in more information and/or want to be a reviewer or apply for the editorial board, please contact Michelle Phillips at michelle.phillips.JTIBS@gmail.com and cc: me as well. The Journal explores the intersection of human behavior, use of technology and healthcare and is sponsored by an interdisciplinary organization called the Coalition for Technology in Behavioral Science (CtiBS). JTiBS is an international forum and repository for the exchange of ideas between professionals engaged in science, practice, policy and education. It promotes interprofessional scholarship and interdisciplinary collaboration, which transcend geographical, cultural, disciplinary and methodological boundaries. JTiBS bridges the separate but overlapping scientific literature and evidence-bases (e.g., it spans behavioral analysis, counseling, marriage and family therapy, psychiatry, psychology, social work and substance use). JTiBS features original research, systematic reviews, and studies of evidence-based practice. It also publishes theoretical articles, position papers, guidelines and editorials on behavioral health, telemental health, mHealth, technology, education, eLearning, innovation, and policy. To achieve its goals, JTiBS embraces a variety of methodologies (e.g., surveys and questionnaires, randomized controlled trials, direct observation, descriptive methods, laboratory and field experiments, economic analyses, conference proceedings, project and program profiles, ethnography, evaluation and resource listings). Review Article (5,000-7,000 words; 50 references): literature, research, concept foci, guideline. Original Research Article (5,000 words; 30 references). Brief Report (2,000 words); encouraging these from folks in training with help of a mentor. Editorial/Commentary (1,000-1,500 words; 10 references). Research in technology and behavioral sciences. Legal, regulatory and reimbursement issues for clinicians. Submissions: http://www.editorialmanager.com/JTBSand proceed to ‘Register Now’ including an ORCID or review Instructions for Authors or the Author Tutorial. -Column Research in Technology and Behavioral Sciences: Where Are We and Where Should We Go? We need good reviewers and are accepting applications for our editorial board. Specifically, we are also looking for reviewers both within behavioral health (i.e., behavioral analysis, counseling, marriage and family therapy, psychiatry, psychology), mental health and psychiatry. We are also included to include social sciences folks, those with interest in culture and diversity and substance use/addiction folks. Furthermore, any ‘good’ journal needs others specialized in pedagogy/andragogy, evaluation, research, law, business, epidemiology, public health, population health, and such. Needless to say, we have interest in telemedicine, psych/mental health apps, e-mail, social media, artificial intelligence, and other technologies that head toward health informatics.